Shown are Syracuse Town Council members, from left, Larry Martindale, Tom Hoover, Larry Siegel, Bill Musser and Paul Stoelting. Hoover and Musser were absent this month. 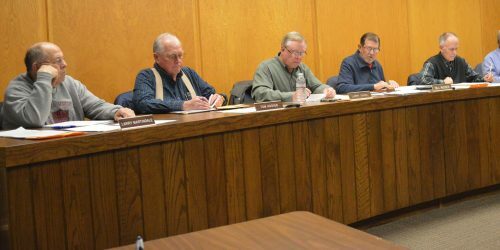 SYRACUSE — Syracuse Town Council approved appropriating $392,122 in economic development income tax funds to help defray the cost of repairing the wastewater treatment plant during its regular monthly meeting Tuesday night, March 20. Councilman Larry Siegel presided during the meeting as Council President Bill Musser and Councilman Tom Hoover were both absent. Henry DeJulia, town manager, reported the wastewater treatment plant project had been publicized in local papers and public comments would be taken on the matter until March 26. He is also working with London Witte, an accounting firm out of Indianapolis, on a rate ordinance. London Witte would also like to do an updated rate study for the town at a cost not to exceed $5,000. Noting there was no contract before them, Siegel said the matter could be addressed at the April meeting. The town’s promotional video is almost complete with just narration and music needing to be added. DeJulia also spoke with Lawson and Fisher, the original engineering firm that worked on the dam at Turkey Creek. He requested input from the company regarding repairs as well as a cost estimate. In the Turkey Creek Regional Sewer matter, both sides are working to get their engineers together to discuss the matter. There were no questions for Police Chief Jim Layne regarding his report. Chad Jonsson, park superintendent, reported the flashlight Easter egg hunt for middle school children will be at 9 p.m. Friday, March 23, with the traditional Easter egg hunt for younger children at 10:30 a.m. Saturday, March 24. Both hunts will be in Lakeside Park. Long Drive will be closed in front of the community center for approximately one hour Saturday morning. There are still spots available for both sessions of the Princess Party to be held April 14. There will be a community planting day at 1 p.m. Saturday, April 21, at Laudeman Park. Approximately 20 trees will be planted that day. Work has begun on the restrooms at the pavilion in Lakeside Park. Jonsson said truss and the roof should be completed by the end of this week with the work completed by Memorial Day. J.P. Developers will come back and clean up the debris remaining from the demolition of the old restrooms and concessions stand on the hill. Fire Chief Mickey Scott reported the outdoor warning siren will be heard sometime this week. He thanked Councilmen Larry Martindale and Hoover for attending the Insurance Services Office meeting held in Warsaw. He also thanked Jonsson for the use of the community center for the railroad response class held March 10. That class had 37 participants from a variety of agencies. Sharon Fowler asked if the Syracuse Police Department has a plan in case there is an active shooter at a local school. Layne said, yes, there is a plan in writing, but when these situations occur, “You don’t go by a plan, you react,” he said.